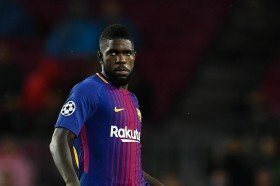 Arsenal manager Unai Emery has revealed his admiration for Barcelona defender Samuel Umtiti amid suggestions that the Gunners could make a formal approach to sign him from the Catalan giants. The north London side are likely to enter the market for a new centre-back during the summer and Umtiti has recently been earmarked as one of their prime transfer targets. Still, the Frenchman could be out of the Gunners' affordable price range, but this has not prevented Emery from heaping praise on the World Cup-winning defender. In an interview covered by RMC Sport, he said: "[Umtiti] is a good player, France has some very good players and the French market is quite attractive for many clubs." Umtiti has more than four years remaining on his existing deal at the Camp Nou, but he is currently out of contention for a regular starting role with Gerard Pique and Clement Lenglet featuring ahead of him. The Blaugrana are understood to be weighing up a move to sign Ajax captain Mathijhs de Ligt in the summer and the added competition could tempt Umtiti to part ways with the club.